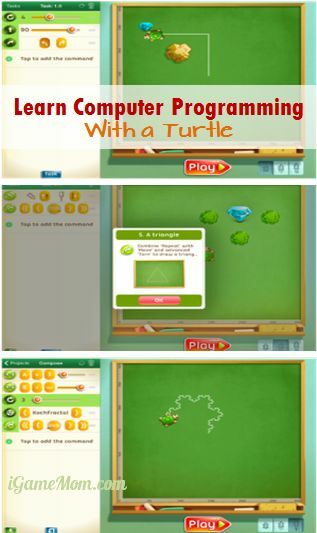 Move the Turtle is an innovative and thought provoking app that teaches kids some of the basics of coding. This app performs a service as more than a programming app but as a thinking app. Really, it helps kids learn how to think. It shows kids how to break things down by degrees and ask what happens when you change this but not that? that but not this? switch the order of this and that? and finally how crazy can we make this turtle move? Multiple users can have their own user names to track separate progress and I encourage parents to set up their own. Behind the Play button, there are three Chapters, each with clearly defined levels of difficulty. Each chapter has nine activities, with each activity teaching or reinforcing a skill. Each activity includes a set of instructions for kids to follow to get the turtle to move the way they need it to in order to complete the activity correctly and, for the most stars, get the diamond in the process. The app has very clear instructions for covering a subject that can be completely foreign to some. It breaks each activity down using step by step instructions that complete a task. The learning in this app happens when you fail. Kids are so curious as to how to solve each problem that they are eager, and the app makes it easy, to try and try again. Frustration doesn’t take hold because each ‘wrong’ move kids make is just a new way to move the turtle. Kids can see and play the solution if they want but won’t get any stars until the task bar is cleared and they try it themselves. That feature isn’t really necessary in the lower levels but comes to be an asset at higher levels when the tasks get difficult. Behind the Compose button, the world is your child’s oyster with 11 commands to choose from, each with an additional advanced command mode. Behind the Project button you will find over 25 project examples that kids can simply view or save in their library for use in Compose mode. If your child wants to see or learn how to make their turtle draw colored polygons, fractal snowflakes, or spirals, this is the section to play in. The range of ages and abilities this app covers and covers well, is staggering. Once my 5 year old is able to read, he should be able to cover most of Chapter 1 without help from me like the 7 year old can now. Chapter 2 was a little trickier for her as it was a few times for me. Chapter 3, however, was where the 10 year old and I stalled a bit more and maybe I peeked at a solution or two in order to work backwards to try and solve some problems. Completely challenging, engaging, and fun. Move the Turtle is available for the iPhone, iPod and iPad. Move the Turtle is $2.99 on the app store. Hello, The ratings at AppStore were very low, I always look at the ratings, not good. I see a 4 star average rating, which is not bad. I usually look at the ratings, but won’t base my decision on them. Do you know some companies hire people go to the app store to write ratings for them?